By Paul J. Crossman, Jr.
Abraham Ives was the first sheriff of record in Rutland County, Vermont. He was born in Wallingford, VT in 1741 and settled his family in the Town of Wallingford of the "New Hampshire Grants" (Vermont) in the early 1770s. He was first elected Wallingford Town Representative in 1779, and again in 1783. His most important public office however, was as Rutland county Sheriff. He served four one year terms from 1781-1875, a job that required extensive paperwork and a good deal of travel over poor roads. In those years, Rutland County extended from the northern boundaries of Rupert, Dorset, and Peru to the Canadian border, containing at least ninety of the towns of present-day Vermont. All of these towns were chartered, either by New Hampshire or Vermont, but many were unorganized and sparsely settled. Part of Ives' responsibility was collecting the state property tax of 1783. Under the Debtor's Prison Law, many persons faced imprisonment because they could not meet their creditors' demands or pay their taxes. More property changed hands as a result of irregularities in Ives' transactions than ever before or since in Vermont's history. Ives and his agents had a reputation for being dishonest. Even after his term as sheriff ended in October of 1875, Ives found himself in a position so untenable that he fled to Wallingford, CT. The Debtor's Prison was abolished in 1833. Roy H. Leonard (1892-1955) was born in Pawlet, VT in 1892. He was a WWI veteran, served as a member of the Vermont National Guard and as a Reserve Officer for 10 years. From 1925 to 1934 he was Chief of Police for Rutland City. He resigned in 1935 and accepted an appointment with the Attorney General's Office as a State Investigator. In 1936 Leonard was elected as Rutland County Sheriff and served for three terms until 1942. While Sheriff, he figured in the investigation of several homicide cases in which the state obtained convictions. He was president of the Vermont Sheriff's Association in 1938 and 1939. He was one of a three-member committee that organized the Rutland Post of the American Legion. He was also and exalted ruler of the Rutland Elks Lodge. Leonard took pride in the accomplishments of his office during his three terms of honest, efficient and courteous service to the people of Rutland County. He was one of the state's best-known law officers in 1942 when he went into semi-retirement. Suffering from a lung ailment, Leonard was advised to move to a warmer climate. He then relocated to Florida with his wife where he died on 19 March 1955 at the age of 63. Geno N. Franzoni (1904-1955) was born in New York City on 4 May 1904. He was a law enforcement officer for 20 years having served eight years as a Rutland city patrolman and seven terms as a Rutland County Sheriff from 1943-1955. He had a wide acquaintance throughout the state and a solid reputation as a peace officer. During his term of office, and prior to establishment of the Vermont State police in 1947, Franzoni had to cope with the most dangerous law outbreaks in this area. He apprehended several men subsequently convicted of murder, solved many jail breaks, and was called in for hundreds of lesser incidents. Among the murders was Ronald Watson who was executed for fatally knifing Henry Teelon, a Rutland taxicab driver, at Chittenden on 24 December 1945. Watson was arrested by Sheriff Franzoni. Franzoni also captured Harold Frotten, alleged slayer of Robert Stratton of Woodford on 21 October 1944. Frotten, who had been incarcerated at the Bennington County Jail, escaped and drove a stolen truck to Granville, NY. Based upon a photograph of Frotten and a report that the stolen truck had been located in Granville, Franzoni traveled there, accidentally came upon the suspect, and took him into custody. Sheriff and Mrs. Franzoni operated the Beacon Restaurant that they built c.1947 near the Rutland Airport. Franzoni was also co-founder and treasurer of the Pico Raceway which was constructed on Route 7 on the site where the General Electric plant is now located. He was a member of the Royal Order of the Moose, Elks Club, Italian Aid Society, and the Police Benevolent Association. He died of a heart attack in Rutland, VT on 1 May 1955 at the age of 50. J. Fred Carbine (1905-1977) was born in Rutland, VT on 23 June 1905. He worked for the Rutland Herald in 1928 as a route delivery driver, transferred to the News Room in 1943, and because Sports Editor and residence expert on local political matters. He served three terms on the Board of Alderman and was Board President from 1945 to 1946. In March 1946 Mayor Temple named Carbine as Police Chief to fill a vacancy created when Chief Harold Potter resigned. Carbine was very vigorous as Chief and vigilant in watching what his officers were doing. He had teams crack down on suspected houses of ill repute. His patrolmen never knew where he might show up to see if they were patrolling their designated area. Although carbine's men often grumbled about it at times, they did what their chief told them. Upon the death of Sheriff Geno Franzoni in 1955, Carbine was named by Gov. Joseph Johnson to fill out the term. When first appointed as Sheriff, Carbine had custodial supervision of the County Jail on Center Street. On one occasion Sheriff Carbine was beaten unconscious by an escapee but recovered in a few days and went across county to bring the prisoner back to jail. Carbine was a member of the New England Police Chief's Association and President of the Vermont Police Association. He was President of the Vermont Sheriff's Association from 1966 to 1968. The county jails were turned over to control of the state as regional correctional centers in 1969. Sheriff Carbine then moved his office from the old Rutland County Jail on Center Street up the hill to the Rutland County Courthouse. He made a special effort to accommodate attorneys by providing competent civil process serving, one of his trademarks. He called for an increase in the patrol duties of deputy sheriffs and for modernizing the police equipment available to deputies. He sponsored several schools for police officers and deputies of the county in conjunction with the FBI. Sheriff Carbine resigned in April 1976 due to ill health and died 12 August 1977 at the age of 72. Lee D. Jones (1929- ) was appointed Sheriff of Rutland County by Governor Thomas Salmon on 8 July 1976 and held that position for 20 years until retiring on 30 June 1996. He was a career law enforcement officer, having previously served as a Vermont State Trooper from 1954 to 1975. Sheriff Jones worked to improve and modernize that department beginning with a reduction in Special Deputies from 120 to 45 men and women. This resulted in more efficient training and a more dedicated work force. New in-service training methods were held every year and included accident investigation, report and affidavit writing, use of radio and radar equipment and firearms training. Sheriff Jones also set up a payroll system in 1977. Robert J. Elrick (1962- ) was appointed as Rutland County Sheriff to replace Lee Jones by Governor Howard Dean on 21 June 1996. Elrick, 33, had been Assistant Director at the Vermont Police Academy in Pittsford. He knew the county well and had developed valuable relationships in the community. He challenged the department's supervisors to cross-train deputies so they could deal with any situation that might arise. After serving as Sheriff for eight years Elrick returned to the Vermont Police Academy as Director. Stephen P. Benard, (1959- ) a ten-year veteran with the Ludlow Police Department, who had 14 years service with the Rutland County Sheriff's Department, became the new Rutland County Sheriff. 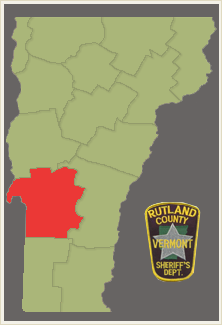 The Rutland County Sheriff's Department currently has a jurisdiction of over 945 square miles of urban and rural areas. The department currently has 19 full time and 16 part time deputies. The Department is under contract to provide patrol services to Chittenden, Clarendon, Hubbardton, Pittsfield, Proctor, Shrewsbury, Tinmouth, Wallington, and West Rutland. Several businesses also utilize RCSD services including Southern Vermont Regional Airport, Carris Reels, CVPS, Devil's Bowl Speedway, Diamond Run Mall, GE, Green Mountain National Forest, Heritage Family Credit Union, Killington LTD, North County Properties and area schools. During 2006 these services amounted to 52,000 man-hours at a cost of $1.3 million. Deputies also respond to calls for domestic violence, assaults, breaking & entering, larceny, intoxication, shoplifting, automobile accidents, license checks, traffic violations, funeral escorts, court bailiff, transports, civil process and more. RCSD currently has 20 cruisers, two snowmobiles and one motorcycle. Standard weapon carried is a 40 cal. Glock model 23. Shifts are generally five to six days on and two days off, both days and nights.